Ear plugs are being offered to the audience on the way in. Brewband, part gig, part dance piece, is the work of dancer, director and choreographer Marc Brew. It brings together three Scottish rock artists with three dancer-musicians. The songs, created by the band, are rock with a folk edge; one moment loud, drum-heavy instrumentals, the next pared-down strings set to poetic lyrics. At times it’s upbeat, at others reflective, Jill O’Sullivan’s fluttering voice adding a melancholic air to the work’s quieter moments. The performers are strikingly versatile; the musicians alternating instruments, the dancers adding their voices or joining the band on keys, drums and guitar. The interaction between them leads to some rather beautiful moments of choreography. 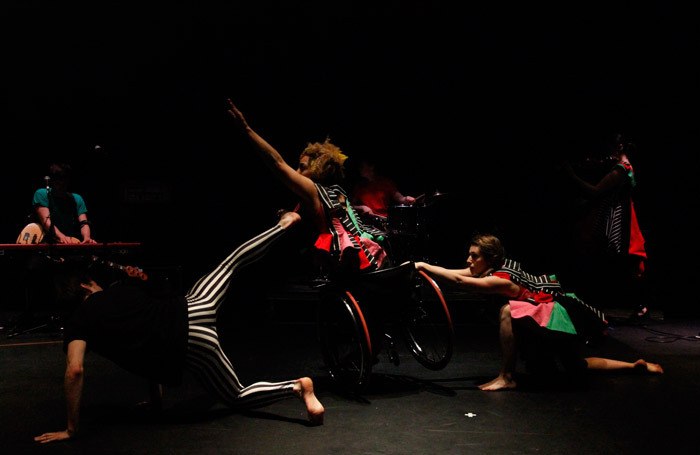 Dancer Marta Masiero and wheelchair dancer Alice Sheppard merge together in a duet that pushes the limits of balance and counterweight; drummer Peter Kelly doesn’t miss a beat as his kit is dismantled by the cast and its various parts shifted about him. As a whole the work has an experimental feel, a sense of these performers exploring their shared skills, styles and experiences. The movement and music may not always feel connected but, in the moments where they do meld, we see the power and possibility of this collaboration. At the end the audience are invited to join Brewband on stage. It’s a fitting close to this unique celebration of music and movement.